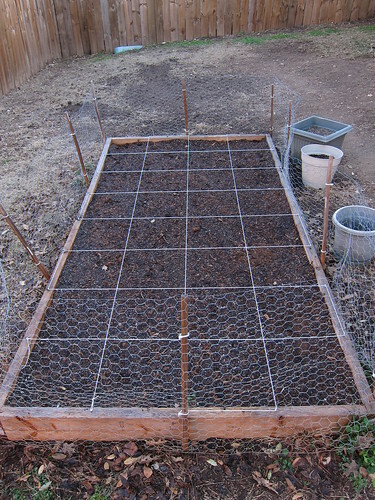 This weekend I got the garden ready for planting. 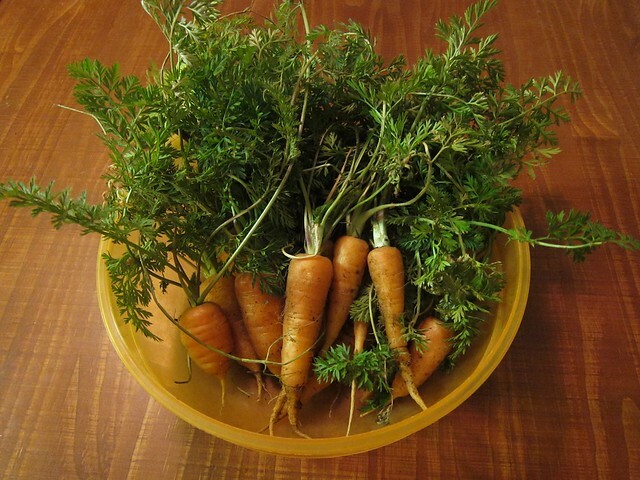 I pulled up the last of the dead plants including some live carrots that weathered our "winter" including the snow. They're Chantenay Red Core Carrots so they're actually supposed to be short and stumpy. I raked out a lot of leaves and roots and added two bags of compost and a small bag of peat moss. I also replaced the strings to make new squares. It was starting to cool off and get dark so I didn't plant anything. I'll probably plant tomorrow morning before heading off to work so they'll have all day in the sun. 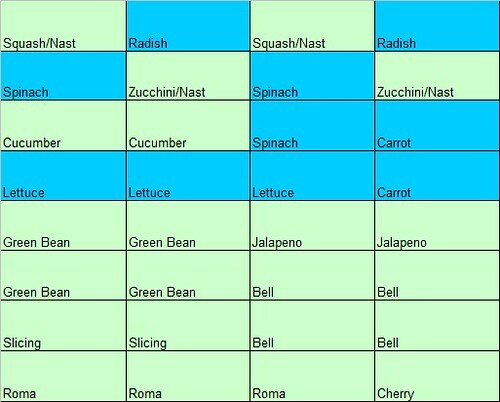 I'll start with everything in the blue squares. As for the seeds I've started some are doing good, others not. 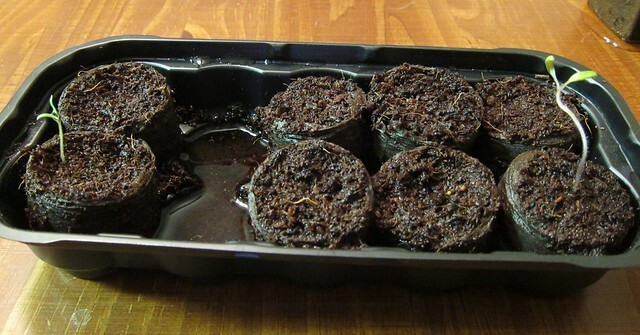 Last weekend I moved the Amish Paste tomatoes into larger peat pots. They're the only ones that had been going strong. 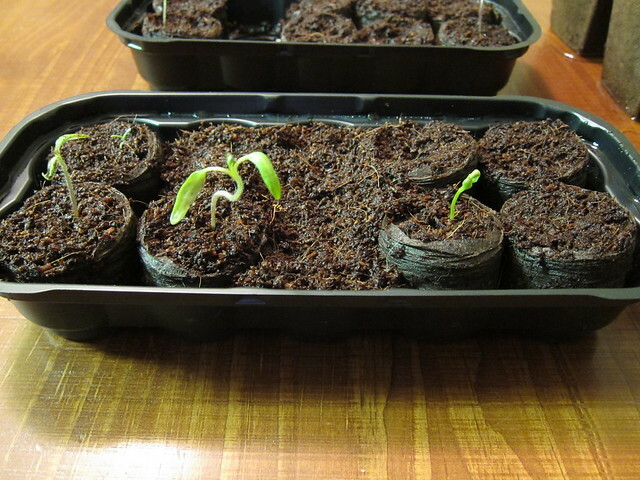 In this tray I have two more paste tomatoes (in case some don't survive the transfer - one is the seedling on the left). On the right is the lone cheery tomato that has sprouted. I've added more seeds to the pods. The jalapenos haven't sprouted at all, but I'm still hoping. In this tray I have three of the Better Boy tomatoes going. The little one in the upper left is one that I planted last weekend. 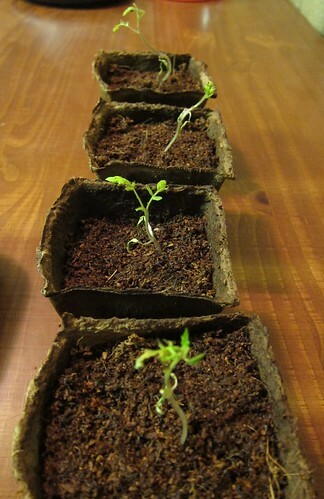 There is also one bell pepper that has sprouted, but the rest haven't. 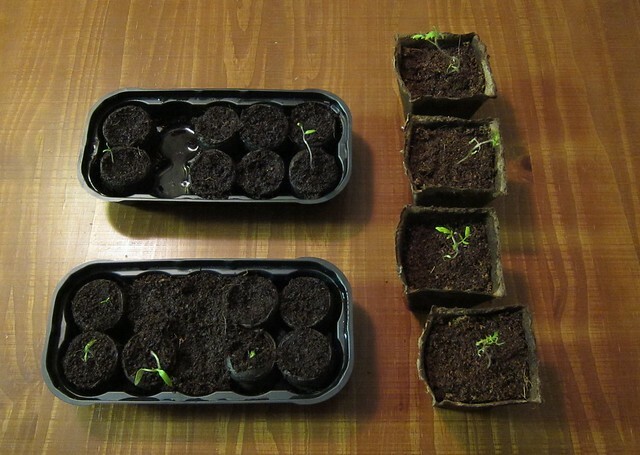 I've added additional seeds as well as some soil with a few bell pepper seeds and a Better Boy tomato. If the peppers don't ever take off I may just buy plants when it comes time to plant the peppers and tomatoes. I'm a little disappointed after last year when all my seeds took that this year hasn't been the same. Oh well! It happens.